Each year roughly 20 billion tons of dirt, rock and sediment from the continents are deposited into the ocean. Based on tectonic movements and sediment displacement there is only 1 Billion ton of this loose sediment that get removed each year. At this rate erosion would have deposited our current sediment accounted for in less then 12 million years, yet this system is still experiencing a much higher input then can be accounted for and still has not reached an equilibrium point. This observation would best be explained if our ocean ecosystem was less then 12 million years old. Each year about 20 billion tons of dirt and rock from the continents are deposited in the ocean from the erosion of land masses, water and the winds. This material accumulates as loose sediment on the hard basaltic (lava-formed) rock of the ocean floor. The average depth of all the sediment in the whole ocean is less than 400 meters. 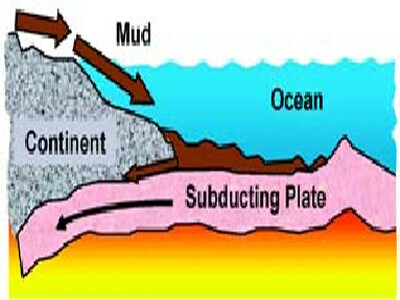 The primary way known to remove the sediment from the ocean floor is by plate tectonic subduction. That is, sea floor slides slowly (a few cm/year) beneath the continents, taking some sediment with it. According to Evolutionary Uniformitarian scientific literature, that process presently removes only 1 billion tons per year. As far as anyone knows, the other 19 billion tons per year simply accumulate. At that rate, erosion would deposit the present mass of sediment in less than 12 million years. According to the evolutionary theory, erosion and plate subduction would had to have been in motion for as long as the oceans have existed, an alleged 3.8 billion years. If that were so, the rates above imply that the oceans would be massively choked with sediment dozens of kilometers deep. A more concise theory based from observation would allow for the explanation is that erosion from the waters of the Genesis flood running off the continents deposited the present amount of sediment within a short time about 5,000 years ago. Observation of all current measurements would seem to indicate that the land masses through erosion and gravity move towards an equilibrium level with the ocean. Which may indicate an earlier state of conditions the earth existed in at the time of creation. 2. Hay, W. W., et al., Mass/age distribution and composition of sediments on the ocean floor and the global rate of sediment subduction, Journal of Geophysical Research, 93(B12):14,933-14,940 (10 December 1988).